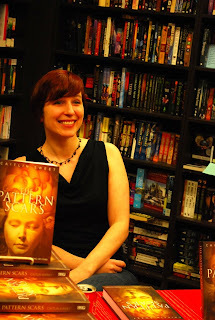 So this past Saturday was the launch of a new novel by the amazing author Caitlin Sweet: THE PATTERN SCARS. It was a very exciting event that took place at Bakka-Phoenix Books. And not just because I got to get my fortune read (evidently I must be patient, which is unfortunate. I am so not good at the patient), but this novel of Caitlin's is a long time coming. I've been fortunate to share much of the journey with her. Well not so much "share", as the experience was hers and hers alone to conquer, but to hear tales of over lunch and drinks and be in awe of her perseverance. If ever any of you have been frustrated trying to get a work published, her story is one that will uplift you. She published two novels back around 2005, and since then had difficulty with this particular novel (both in actualising it and finding it a home). It took her a while to find it a publisher, but she did at the amazing Canadian press ChiZine - a publisher of literary dark SF/Fantasy. Also they have some of the most gorgeous covers in the biz. So THE PATTERN SCARS has a home now. I have yet to read it, but I am told it is heartbreaking and beautiful and I wouldn't expect anything less. Nola is born into poverty in Sarsenay City. When her mother realizes that Nola has the gift of Othersight and can foretell the future, she sells her to a brothel seer, who teaches the girl to harness her gift. As she grows up, she embraces her new life, and even finds a small circle of friends. All too soon, her world is again turned upside down when one of them is murdered. 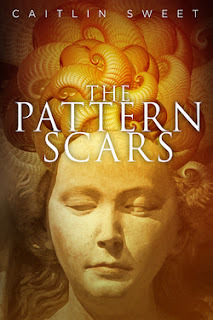 When a handsome, young Otherseer from the castle promises to teach her, she eagerly embraces the prospects of luxury beyond what she can imagine and safety from a killer who stalks girls by night. Little does she know that he will soon draw her into a web of murder, treachery, and obsessive desire that will threaten the people and land she holds dear, and that she will soon learn the harshest of lessons: that being able to predict the future has nothing to do with being able to prevent it.